This season, Princess Alaska Lodges’ Mt. 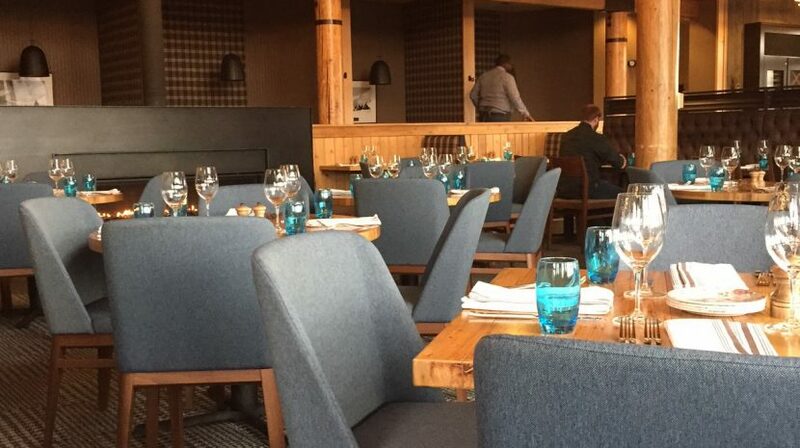 McKinley Princess Wilderness Lodge unveiled� North Fork Restaurant. The incomparable view remains the same as the former Mountain View Dining Room, but the menu is fresh and the vibrant décor is a modern take on the warm, rustic lodge that makes for a truly memorable dining experience. The restaurant gets its name from the north fork of Ruth Glacier, one of the routes climbers take to scale Denali. Its design lends a nod to the mountaineering heritage of Denali and celebrates the days when pioneers adventured to the state looking for fortune and instead discovered the infinite beauty of the Alaska wilderness. But let’s talk about the food! The North Fork Restaurant chefs pay tribute to early Alaska values of sourcing fresh, local ingredients and preparing meals from scratch. The brand-new menu is filled with creative choices that offer something for every palate. Start with salmon poke tacos or an Alaska sausage sampler served with house-made onion marmalade. Vegetarian? A whole-roasted cauliflower with yogurt, feta and herbs might get your appetite going. On the heartier side, North Fork Restaurant has choices like wine braised beef short ribs with herbed pappardelle pasta and even crab-stuffed halibut for the ultimate Alaska delicacy. The chefs use slow cooking methods like roasting and braising to create flavorful dishes and transform ingredients. We can’t wait to show you what we’ve got cooking, and we know you’ll love every minute of your visit to North Fork Restaurant.